Beyond the black snow-capped spruce which blanket the hills surrounding the placid harbour this morning the sky seems undecided. In a typical December manner, it vacillates between allowing the mellow light of a low sun to fall on my shoulders and piling high the mountainous steel blue clouds which dwarf Bottle Hill. Off to the West’rd the crest of Buttercup guarding the entrance to Blue Pinion peeks above the treeline and glows in a shaft of sunlight. So too does the back side of English Hr. Mountain which appear to have risen above its stature to reach the heavens and its gift of light. Above them all, intricate layers of tufted clouds stack themselves in an ever-changing display of shape and form as though an omnipresent hand were stirring the pot. In one moment there are deep blue’s evocative of the arrival of night, then, thin wisps of ethereal whites appear which fade to nothing as I watch. Then, if I look beyond the harbour entrance, the thin strip of black underlining the horizon which I know to be the Burin Peninsula, is dwarfed by curtains of clouds ascending as far as my eye can see. At the high-water mark last night’s dusting of snow has yet to melt. It clings tentatively to blades of grass and branches of ambitious spruce stunted by years of salt spray. Clusters of dead straw, yellowed and rigid, stand aloof, unmoved and unaffected. Where layers of grass form miniature canopies for hardy insects and winter mice, dark green shadows remain protected from the thin white covering. In the land-wash dark clusters of seaweed cling to the rocks and slipways, their rich brown and green tones adding depth and texture to a shoreline still wet from the falling tide. Occasionally, when the sun peers through an opportune opening, fine jewels of salt water wink back at me, reflecting the mirrored harbour surface. From the Barachoix Point to the Government wharf, from Edgar Dyett’s store to Burkes Cove, from the mouth of Pittman’s Brook to the headland at Louis’s Cove there is not a ripple, not a single wave, just water unbroken by even a gentle breeze or the breach of an errant fish. It extends beyond Eastern Point, the Island and on out through Fortune Bay, perhaps all the way south to Jamaica and across the Atlantic Ocean to the shores of Spain. I imagine a boat making its way out the harbour splitting the surface like a knife sending symmetrical waves to the east and the west which gradually lose form and eventually reach shore with a gentle lick against the waiting rocks. But there is no boat this morning. Fishermen are taking a break from harvesting; enjoying the company of family and friends. Yet they do not remain idle. 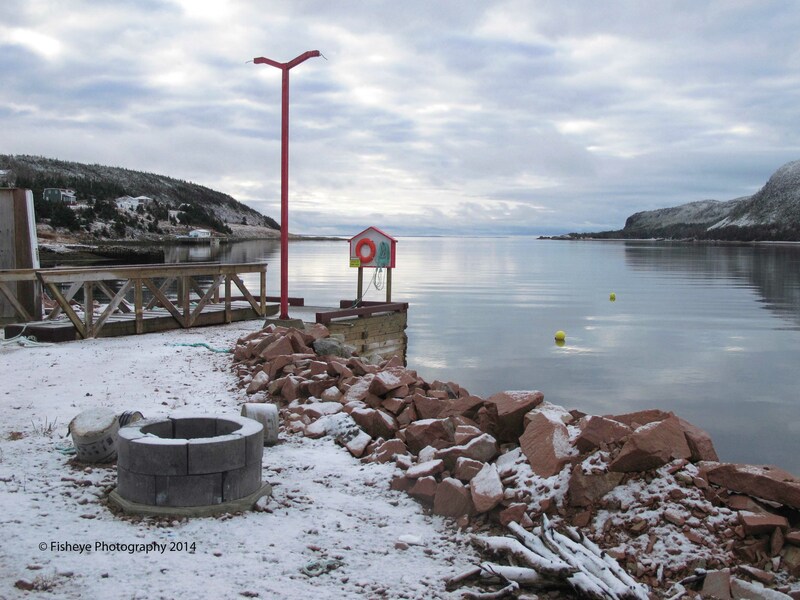 Along the side of the cove where the Young’s family business operated during the last century, chimneys in smaller fishing stages announce that work is progressing on preparation of gear for the next fishing season. Tendrils of white smoke lazily creep forth from chimneys around the harbour and by the time they’ve reached the height of church steeples they are no more. Patches of blue sky behind Bottle Hill accentuate its gracious undulating shape which sweeps upward to a delicately rounded apex. The scree, dressed in a cape of white, draws attention to the dark evergreen branches now transformed into a salt and pepper forest. A moment ago I heard a chickadee call it’s courageous, small voice, announcing its presence to all who care to listen. For just a few seconds a sliver of sunlight penetrated the cloud and made a pass across the cliff face of Winterhouse Hill as if to shout, hey look what I’ve found! I stand still and marvel at the stoic rocks which have watched down over this community from its beginning. I imagine it as the great glaciers flowed seaward, taking with them soil, tress and boulders to be left miles away. I then picture it as it emerged from retreating rivers of ice transformed into an expansive wall of sheer granite standing guard, watching our backs as we look to the sea. Pittman’s Brook falls has been serenading us for the entire season; it’s readily recognized timbre serenading the entire harbour; its resonant tones of cascading water enhanced and accented by the texture of splashing and spraying as it flows down a staircase of layered rock. Seagulls have been bathing and socializing in its effluent for several days, quietly splashing water beneath their wings and dipping their beaks and heads. Earlier this morning, a great black-backed gull stood at the water’s edge for almost an hour, listening, watching and moving inch-by-inch down the beach as the tide fell, maintaining its contact with the retreating ocean. Its black eyes observed every movement and its head turned to investigate the smallest sounds, even that of a camera shutter clicking. Friar Rock, ever-present and elegant, stands solitary as the waters escaping from a string of ponds that reach for miles into the woods behind St. Jacques and Belleoram swirl past on their way seaward. With equal strength it awaits the rising tide and stands firm against every force of nature. Today it is wrapped in the quiet tingling sounds of water returning home to the sea. One would be challenged to not pass reflection on the peacefulness, the solitude and the overpowering sense of belonging that accompanies an early morning walk anywhere in this community of St. Jacques. There is harmony between the fleeting human soul and the eternal spirit of nature in places like this; a harmony which makes each step soft and light, each glance at one’s surroundings fulfilling and accepting. Every fibre of being feels the oneness of body and soul; of water and land, of sea and sky, of yesterday, today and tomorrow. I left St. Jacques in 1942 with my family(George and Emma Paul).But, St. Jacques will always be my home and I love everything I read or hear about my birthplace. I miss John Burke’s articles from the newspaper but I think I saved most of them. Even though I was only ten at the time I still remember a lot of the names and places and happenings and feel nostalgic when I read your well written reflections. I will forward this to my brother as his heart is still with his childhood and growing up in St. Jacques. Keep up this most excellent writing as it refreshes our memories and keeps us young! Alex, Happy New Year! I thoroughly enjoy each post. When will you write a book? 2015? Your writing is inspiring. It does make me feel that I am looking out at the Harbour with you. Very peaceful, indeed.